Learned and thoughtful, John Adams was more remarkable as a political philosopher than as a politician. "People and nations are forged in the fires of adversity," he said, doubtless thinking of his own as well as the American experience. 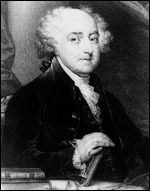 Adams was born in the Massachusetts Bay Colony in 1735. A Harvard-educated lawyer, he early became identified with the patriot cause; a delegate to the First and Second Continental Congresses, he led in the movement for independence. During the Revolutionary War he served in France and Holland in diplomatic roles, and helped negotiate the treaty of peace. From 1785 to 1788 he was minister to the Court of St. James's, returning to be elected Vice President under George Washington. Adams' two terms as Vice President were frustrating experiences for a man of his vigor, intellect, and vanity. He complained to his wife Abigail, "My country has in its wisdom contrived for me the most insignificant office that ever the invention of man contrived or his imagination conceived." When Adams became President, the war between the French and British was causing great difficulties for the United States on the high seas and intense partisanship among contending factions within the Nation. His administration focused on France, where the Directory, the ruling group, had refused to receive the American envoy and had suspended commercial relations. Adams sent three commissioners to France, but in the spring of 1798 word arrived that the French Foreign Minister Talleyrand and the Directory had refused to negotiate with them unless they would first pay a substantial bribe. 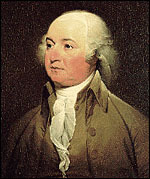 Adams reported the insult to Congress, and the Senate printed the correspondence, in which the Frenchmen were referred to only as "X, Y, and Z." The Nation broke out into what Jefferson called "the X. Y. Z. fever," increased in intensity by Adams's exhortations. The populace cheered itself hoarse wherever the President appeared. Never had the Federalists been so popular. Congress appropriated money to complete three new frigates and to build additional ships, and authorized the raising of a provisional army. It also passed the Alien and Sedition Acts, intended to frighten foreign agents out of the country and to stifle the attacks of Republican editors. President Adams did not call for a declaration of war, but hostilities began at sea. At first, American shipping was almost defenseless against French privateers, but by 1800 armed merchantmen and U.S. warships were clearing the sea-lanes. Despite several brilliant naval victories, war fever subsided. Word came to Adams that France also had no stomach for war and would receive an envoy with respect. Long negotiations ended the quasi war. Sending a peace mission to France brought the full fury of the Hamiltonians against Adams. In the campaign of 1800 the Republicans were united and effective, the Federalists badly divided. Nevertheless, Adams polled only a few less electoral votes than Jefferson, who became President. On November 1, 1800, just before the election, Adams arrived in the new Capital City to take up his residence in the White House. On his second evening in its damp, unfinished rooms, he wrote his wife, "Before I end my letter, I pray Heaven to bestow the best of Blessings on this House and all that shall hereafter inhabit it. May none but honest and wise Men ever rule under this roof." Adams retired to his farm in Quincy. Here he penned his elaborate letters to Thomas Jefferson. Here on July 4, 1826, he whispered his last words: "Thomas Jefferson survives." But Jefferson had died at Monticello a few hours earlier.